Playtesting D&D Next has been a lot of fun and has created many interesting discussions within our group related to game design, play styles, and editions. Sometimes, however, our group finds something where we are all unanimous. 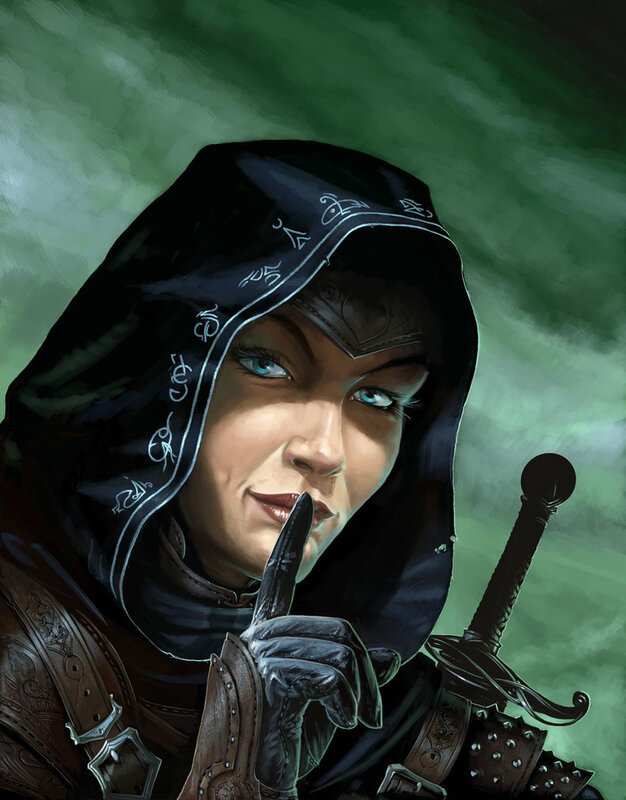 Such a thing is the design of lurkers in 4E and the design of the rogue in D&D Next. It was no surprise to us to see the rogue be designed as it is. It continues a long trend from the very beginning of 4E, and it goes like this: A lurker is often a creature that disappears from site, landing a devastating blow the next turn. And, here’s the added kicker that really seals the deal: ‘devastating’ is usually defined as double damage (and sometimes less). It has a rechargeable melee power that deals 2d6+8 damage (avg damage of 15, which is the standard value for limited monster damage). It can use this on round 1. The power also weakens, for an added boon. On round 2, it cannot use that power, but could use its basic claw attack for 1d6+7 damage (avg of 10.5, which is standard for normal monster damage at this level). It can also become invisible as a standard action, which recharges every time it uses the blighted claw from step 1. So, the idea is this round it hides. On round 3, it can attack again with the strong blighted claw. There are multiple problems here. First, assuming it hits then over the course of 4 rounds we get a total average of 30 points of damage (two attacks). Over the course of 5 rounds we get a total of 45 damage. If the monster had just used its claw, it would cause an average of 42 damage in 4 rounds (12 more), or 52.5 over 5 rounds (7.5 more). In other words, assuming it hits, it does more damage by not being a lurker! I wish that were the only problem, but it isn’t. But, first, let’s make some benefits clear. 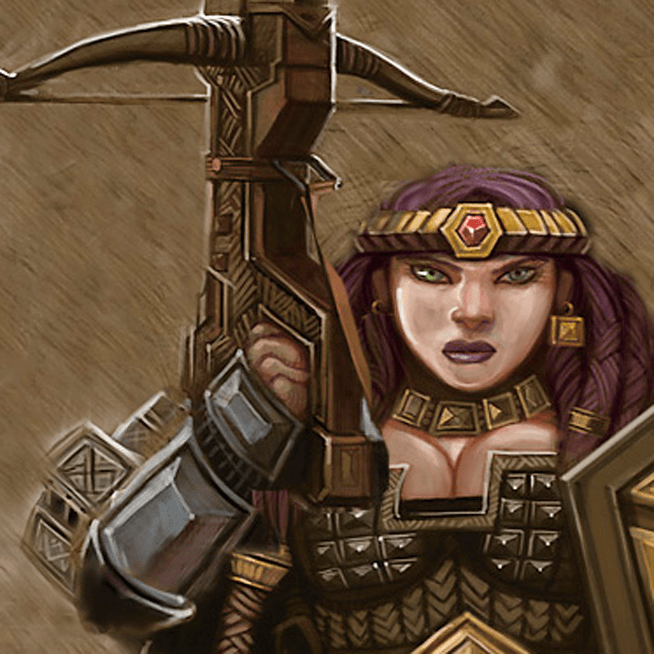 By hiding, the 4E lurker gains a bonus to defenses against non-AoE attacks. The lurker is likely to survive longer due to its invisibility. In addition, when invisible it gains an accuracy boost through combat advantage (+2 to attack). But, let’s get to the additional issues. Movement/control/tactical limits are issues. It isn’t hard for a monster to need to charge in the first round. If the lurker charges, it can only do a basic (lower damage) attack. If it hides, that erodes its average damage. Similarly, it could find itself going invisible and finding that a foe moves away to where it can’t be reached on the following round with a move action. The lurker could also be subject to control. If it is slowed, dazed, prone, immobilized, restrained, and so on it won’t be likely to get off its higher damage attack. This is especially problematic at high levels, where PCs teleport, move one another, and have many control capabilities. The lurker may also suffer from the ultimate form of control: it could be dead, unable to take that next (high damage) attack. An additional issue with lurkers is that they promote the successful focusing of fire. One of the easiest ways to challenge PCs is to have monsters that are all critical to the combat. When the party can’t agree on which foe to target because they all seem important, the monsters live longer. When the party knows to target a certain foe, they focus fire and kill it quickly, then move onto the next target and repeat the process. Lurkers hide, and this makes them a less likely target. Instead of 5 possible targets in a combat, the party sees 4. If the lurker is a PC, the monsters target the other PCs… over time it drains important resources from the other PCs. One last (minor) problem. This specific lurker really has little to benefit from allies. It’s powers are self-focused, requiring the successful use of one power to use the other. That limits potential benefits it could receive from allies. The biggest issue, however, is opportunity cost. There is a lot I could write here, but at a fundamental level this is all about a bird in the hand being worth more than two in the bush (or economic principles such as the value of a dollar today opposed to receiving one tomorrow). If you have the choice between damage now or damage later, even double-damage later, you are better off with damage now. This is true for many reasons. – You might kill a creature now, vs over-kill them next round. – You might wound a creature now, allowing your ally to kill it later. – You might not get to attack next round, as discussed above. Not all lurkers are like this. 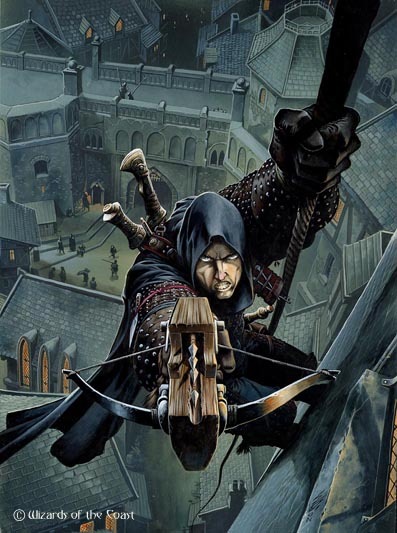 Many lurkers (even in early 4E) gain a bonus to damage when they have combat advantage. We see this in creatures that flank, such as the Goblin Blackblade. It attacks every round, can shift in fun ways, and gets bonus damage when it has CA. My favorite may be Joplin the Sly, from MV:NV (Monster Vault, Nentir Vale: buy this book if you don’t have it!!!!). Joplin has a basic attack that does expected damage, but the same basic power climbs to limited damage if Joplin has CA, and Joplin goes invisible until the start of her next turn. All in one power! She adds an encounter interrupt to use her basic attack with CA when a foe misses her. That’s a lurker! Attacking every round, bonuses when lurking, cool encounter power, synergies with allies… YES! Hiding in D&D Next requires an action. The rogue therefore becomes a 4E-style lurker. For the opportunity cost of hiding, it gains Advantage and sneak attack dice. I won’t get into the mechanics (NDA), but from play it is absolutely clear that the rogue is better off not hiding. As expected, in play hiding produces sub-par damage for all the reasons stated above and causes all the problems to allies stated above. To add insult to injury, the damage the rogue inflicts is low both with and without sneak attack. The fighter outshines the rogue at all times. All of this together is more than math or economic principles – it creates a frustrating experience. 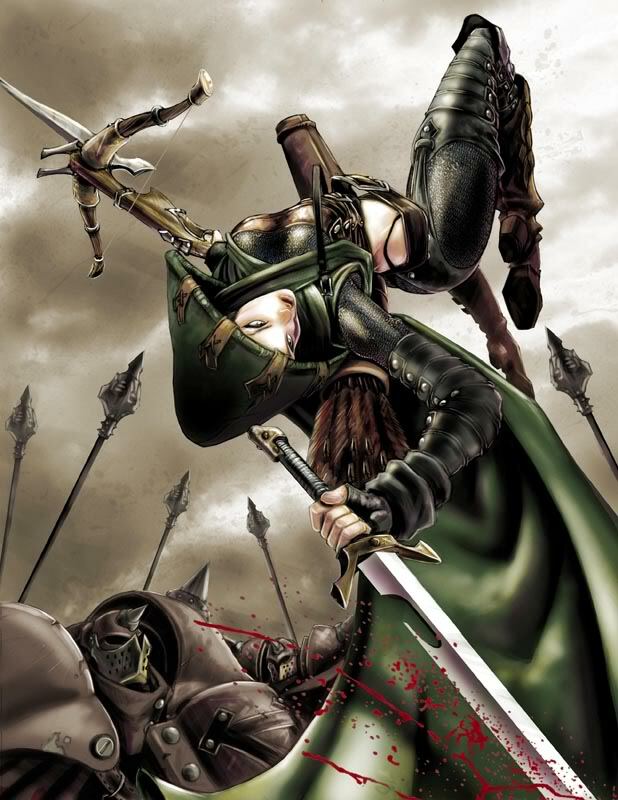 In the mind of a player, the rogue is a cunning devastating attacker. He or she is cool! The lurker mechanic is a poor way to reflect that expectation. It is really time to leave the lurker fallacy behind. The idea of double damage every other round is fundamentally flawed. Due to opportunity cost, it doesn’t even work well with a small boost. It actually has to reach a really broken level to be worthwhile… and that would make it unbalanced at high levels or with certain magic items. So, what would work? – Lurkers (both monsters and PCs) in D&D Next should be able to lurk most of the time. – Hiding should not cost an action, but should be part of movement. – The damaging mechanic for being a lurker should be achievable nearly every round, if not every round. – Lurking should provide a tactical and defensive bonus, but not one that is so insurmountable as to hurt allies. – Forget the twig blight’s design, emulate Joplin the Sly! This entry was posted on October 15, 2015 by Alphastream and tagged 5E, Monsters, Playtesting, Rogue.